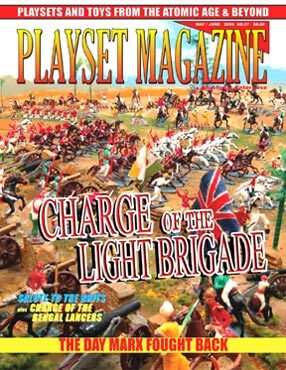 Issue 27 Charge of the Light Brigade! This set had a surprising number of variations, some of which have been photographed for us by our own Webmaster Jim Clouse (examples from collector Ed Borris). Wherever we find them, we've done our best to cover them all. 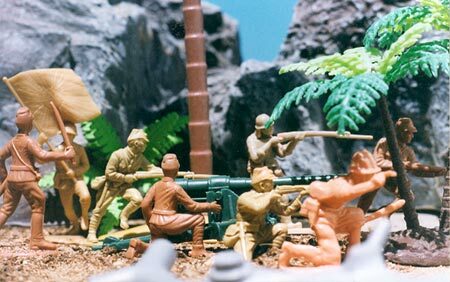 Unlike many other Marx HO sets, which utilized "downscaled" figures from Marx' other lines, these are unique figural sculptures found only in Charge of the Light Brigade. Wildly colorful filled with figures, horses, cannon and terrain, they are a blast to see. We cover them from a different perspective this time: why the Charge of the Light Brigade was one of the most important sets the editors ever owned. It's a "growing up" piece involving the Errol Flynn movie and lawn mowing, but we also cover the unknown truth of the real Charge that took place in Balaclava 1854 (no, not the story about the guy who sent them down the wrong valley). This issue also tells the story of The Day Marx Fought Back (and how Magic Marxie Helped) -- this one puts you right inside the 7th floor of the fabled Marx Head Quarters at 200 Fifth Avenue as decisions are made about the coming onslaught of competitors and TV advertising. Frank Rice and Charles Marx have their steady hands on this one. There's a big Marx Wagon Set feature by Dave Foley, too, and small pieces on "Andy's Whelen's Giant Blue and Gray Battle - 1962"; Greg Liska's Keeping it Real: The British Squad; War Store soldier shop opening and lots more including reviews, news, Marx Memory and Readers Collections. And ads -- lots of vintage stuff available for you to just pick up the phone and call to get! Here's the Issue 27 PM Puzzler - - In COLOR!